August 31, 2015 (FSM Department of Foreign Affairs): At the invitation of T.H. Narendra Modi, Prime Minister of the Republic of India to the FSM to attend the Second-India Forum for Pacific Islands Cooperation, Vice President Yosiwo P. George headed a delegation to India to participate in the Forum. Vice President George was accompanied by his wife, Mrs. Antelise Y. George, T.H. Marion Henry, Secretary of Resources and Development, Mr. Brendy H. Carl, Deputy Assistant Secretary for Asian Affairs and Mr. Herman Semes Jr., Special Assistant to the Vice President. On the way to India, the delegation made a stop-over in Hong Kong to catch the next flight out to India. In Hong Kong, Vice President George and his delegation had an opportunity to meet with the FSM Honorary Consul, Dr. Tan Siu Lin and Chairman of the Board of Directors of Luen Thai Holding Limited and at the Luen Thai Headquarters. The delegation first toured Dr. Tan’s office and followed by a meeting with the Board of Directors. In the short meeting, Dr. Tan thanked the Vice President for his visit to Hong Kong after assuming his post as the Vice President of the FSM. Vice President George responded by thanking Dr. Tan for the warm welcome and hoped that he will continue to promote FSM in Hong Kong. The delegation departed on the same day to India. While in India, Vice President George and his delegation joined the delegations from the Pacific Island Countries (PICs) to visit Taj Mahal in Agra City in the Uttar Pradesh State and the Amer Palace in city of Jaipur. They also attended a number of presentations by the Ministers’ of External Affairs, Culture and Tourism, Power, Coal and renewable energy. On August 21, 2015 at 6:00 pm in Jaipur, Prime Minister Modi opened the summit and allowed each head of delegation for a 5 minutes remark. Vice President George was the 4th to deliver his statement where he personally thanked the Government of India through Prime Minister Modi for hosting a forum that will further cemented the friendly cooperation and friendship between India and the Pacific Island Countries. He furthered touched on a number a challenges that are facing the PICs that will require collaborative efforts, such as climate change and so forth. On August 22, 2015, a short ceremony was held in the Vice President’s room in New Delhi on a donation of $200,000 specifically for the Department of Resources and Development on a project entitled, “FSM Intergrated Agriculture Census.” Ambassador Extraordinary and Plenipotentiary of the Republic of India to the FSM, H.E. Lalduhthlana Ralte presented a symbolic check to Vice President George to official hand over the donation. Both parties exchange pleasantries and the ceremony was concluded. 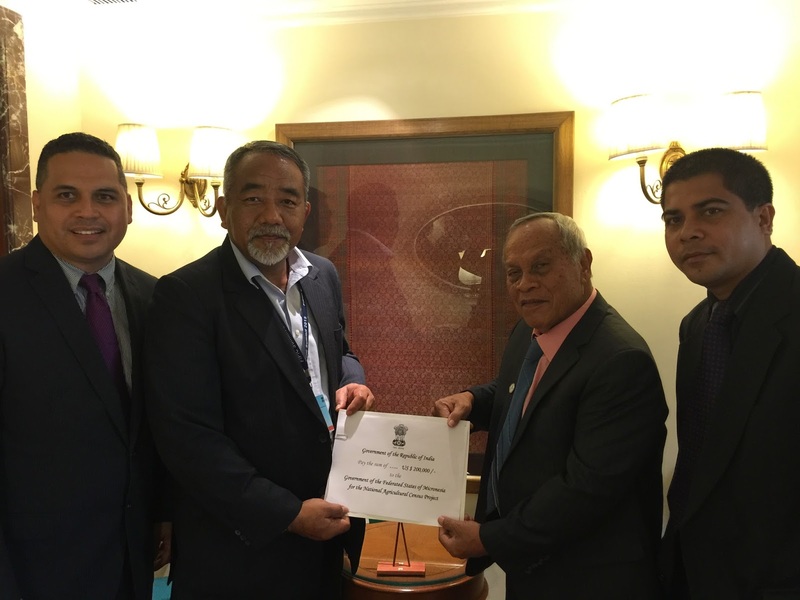 The delegation departed India for Pohnpei in the evening of 22 August 2015.